Fremantle Council wants to let the Carriage Cafe on the Esplanade operate for another three years but on a month by month term. The reason for the extension is that the City wants to delay the development of the Esplanade Hub by up to three years. The Esplanade Hub was supposed to be developed between the Youth Plaza and ferris wheel and a new hospitality venue built there, and the Carriage Cafe would have had to be removed or demolished, but the City of Fremantle no longer has the money to realise these plans. The item is on the FPOL committee agenda this coming Wednesday. It’s LADIES NIGHT at the skatepark tonight in Fremantle. From 7-9pm only women/girls will be allowed to use the Esplanade Youth Plaza, so take advantage of it ladies! It is a brilliant sunny Sunday in Fremantle so head out to the Esplanade Youth Plaza for Switch it On the National Youth Week event there. It is a lot of fun to watch and participate in and is going till late afternoon. Here some impressions of it. The Changing Your Tune event at the Fremantle Esplanade Youth Plaza skatepark was a lot of fun but also a stark reminder that so many people in Australia suffer from mental health issues and commit suicide. There was live music, burlesque and skating coaching clinics, but also hundreds of shoes on display to remind us that suicide is the leading cause of death in Australia for 15-44 year olds. In 2016 3,027 people took their own life, with the Aboriginal rate of suicide twice as high as that of non Aboriginal people. Western Australia has the highest rate of Aboriginal suicide in Australia, and a very disturbing trend of very young people seeing no other way out of their despair than killing themselves. 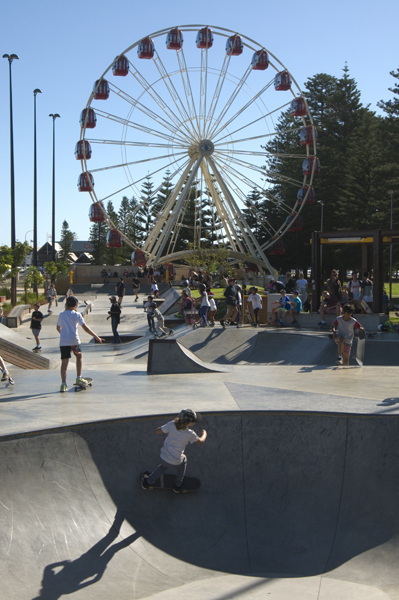 Fremantle is celebrating the first birthday of the Esplanade Youth Plaza skatepark and what a success it has become after all the community controversy about it being in the wrong location on the Esplanade. I too was, and still am, not convinced that the locations is the best one but I have no hesitation acknowledging that the EYP has become a great attraction for young people from all over the place. Yesterday afternoon the place was packed with kids of all ages, parents enjoying the sunshine and as always when I come past there was an overall good vibe around the place with older kids showing the younger ones how to do certain movements. Freo Mayor Brad Pettitt said that the EYP has won six national and state awards and was “one of the best all-ages outdoor youth spaces” that had hosted dozens of events since opening last year. There is no doubt for me that Fremantle Council backed a winner here and I hope the entire community will now learn to love the EYP. My one big concern is all the kids making their way there on their skateboards in the middle of the road without wearing helmets, or caring too much about cars reversing out of parking bays, and I fear someone will get hurt soon.